Our world is getting louder. Excessive noise is a public health problem and can induce hearing impairment, cardiovascular disease, hypertension, sleep disturbance, and a host of other psychological and social behavior problems. The World Health Organization estimates that 360 million people worldwide have disabling hearing loss. Occupational hearing loss is the most common work-related illness in the United States; NIOSH estimates that approximately 22 million U.S. workers are exposed to hazardous noise. Understanding and minimizing the risks associated with noise exposures are the keys to preventing noise-related hearing loss. The ubiquity of smartphones (~2 billion users as of 2016), their constant network connectivity, the built-in geographic information system functionality, and user-interactivity features present a great opportunity to revolutionize the way we look at noise, its measurement, and its effects on our hearing and overall health. The ability to acquire and display real-time noise exposure data raises people’s awareness about their work (and off-work) environment and allows them to make informed decisions about hearing hazards and overall well-being. NIOSH hearing loss prevention researchers conducted several studies on smartphone sound measurement apps to examine their accuracy and applicability to the occupational noise environment. Most of the apps on the market are aimed at the casual user and lack the accuracy and functionality necessary to conduct occupational noise measurements. 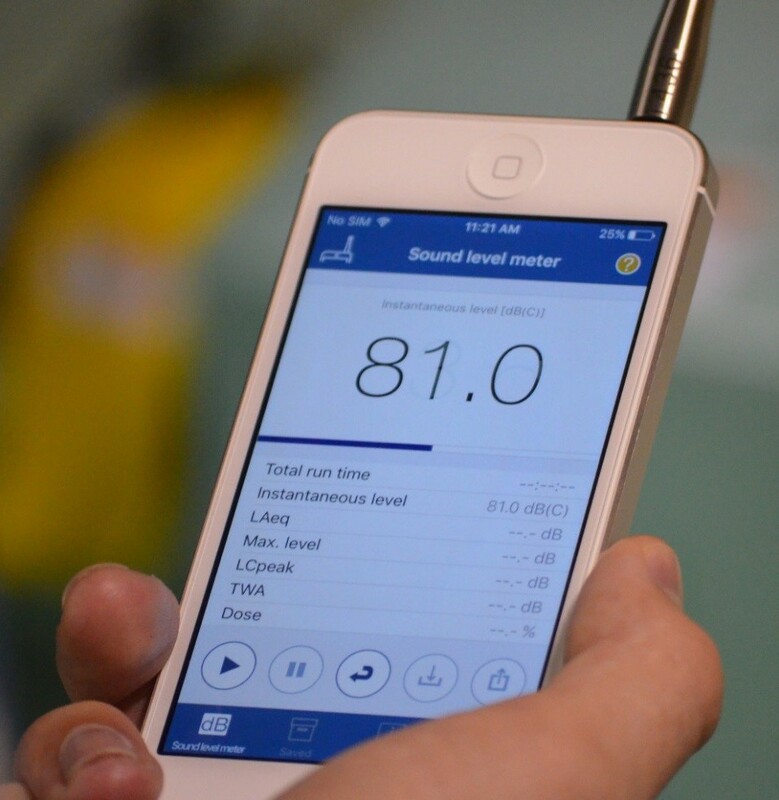 This lack of reliable apps led us to develop the NIOSH sound level meter application (https://www.cdc.gov/niosh/topics/noise/app.html) for iOS devices, which is freely available to the occupational safety and health community as well as the general public. The new app can help industrial hygienists, occupational safety and health managers, and workers who may not have access to professional sound measurement instruments to measure noise levels on the spot. The app is also designed to help raise awareness among workers about their work environment. Researchers hope that increased awareness could lead workers and managers to request professional noise surveys and to implement engineering controls or hearing conservation programs to reduce the risk of noise-induced hearing loss. Although the app is not meant to replace professional sound level meters or noise dosimeters or be used for compliance purposes, we recommend that those interested in making proper noise measurements use an external microphone that can be calibrated with an acoustical calibrator similar to how a professional instrument is calibrated before use. Read more about the app on our science blog and share your thoughts on how we can make this tool better and more useful to you.